AT&T and Verizon-certified cellular modem with voice and data offers future-proof, high speed, always-on connectivity. 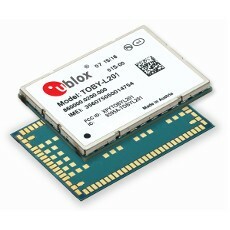 u-blox, a global leader in wireless and positioning modules and chips, announces TOBY-L201, the world’s first 4G LTE Cat 4 module with 3G WCDMA fall-back, which works on AT&T and Verizon networks. TOBY-L201 switches automatically or via AT command to AT&T’s or Verizon’s network, without the need to load new firmware. Depending on which carrier’s SIM card is inserted, TOBY-L201 recognizes the carrier and starts on that carrier’s network. If devices are equipped with two SIM cards or a configurable SIM chip, TOBY-L201 can be switched between operators on-the-fly via a simple AT command. The versatile TOBY-L201 module offers best-in-class download speeds up to 150 Mbps and comes in a miniature 24.8 x 35.6 mm LGA form factor. It operates from -40°C to +85°C, making it suitable for most demanding automotive, industrial, and consumer devices. TOBY-L201 is ideal for infotainment systems, telematics control units, rugged mobile terminals, set-top boxes, notebooks, tablets, as well as high-speed M2M applications like alarm panels, digital signage, mobile health, remote security and video systems. TOBY-L201 includes IPv4/IPv6 stacks for secure Internet-of-Things applications. The module is designed for easy integration with u-blox GNSS modules and chips to provide both outdoor and indoor positioning capabilities. TOBY-L201 will also include an extensive suite of IP protocols including TCP/IP, UDP/IP, HTTP, FTP, and SSL. Linux supports TOBY-L201 modules natively, while u-blox provides RIL software for Android and Embedded Windows free of charge. The modules are produced in ISO/TS 16949 automotive-certified production sites to ensure the highest quality and reliability.